Arnold Roth testified last week in Washington DC (as we noted here) at a hearing of the House Oversight and Government Reform Committee, Subcommittee on National Security. The hearing bore the title “Seeking Justice for Victims of Palestinian Terrorism in Israel”. As a report on the DailyCaller.com website put it, "From the hearing’s outset, the feelings of frustration from the committee and victims were evident." Justice is a theme we feel gets far too little attention when the victims of terrorist savagery – and especially their rights - are considered. It heard four oral presentations. 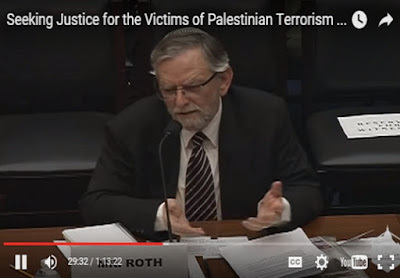 In order, they were delivered by Brad Wiegmann, Deputy Assistant Attorney General, National Security Division - Department of Justice; Sarri Singer who founded and manages Strength to Strength, a not-for-profit that bring victims of terrorism together to share and grow from their experiences; Peter Schwartz whose nephew Ezra was murdered in a November 2015 terror attack in Gush Etzion [our post]; and Arnold Roth. Below is an edited version of Arnold Roth’s written testimony [the version filed with the Committee is here]. Ordinary people like us rarely get the chance to speak to the truly powerful - we hope readers will keep that in mind even as we apologize for publishing what is almost certainly the lengthiest post in this blog's ten year history. My name is Arnold Roth. I live in Jerusalem. 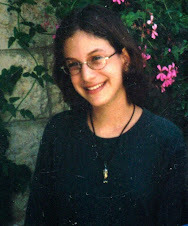 My daughter Malki was murdered there in a Hamas bombing attack on August 9, 2001. She was 15. I appreciate very much the invitation to testify from the very specific vantage point of a close-knit family devastated by an act of murder driven by terrorism. The death of a young child is generally regarded as one of the most challenging traumatic experiences life can serve up. Check with Amazon; there is a wide literature that guides parents who find themselves in that awful position. A smaller number of books exists that seek to comfort the parents of a child killed by a criminal act. But the death of a child by terrorists has sharp, painful angles to it that defy book-laden advice. If there is a literature of help for parents like my wife and me, it’s a tiny bookshelf. And being able to read Hebrew is an advantage. Practically everything I know about terrorism and its victims I learned through the prism of Malki’s murder. Thank you for the opportunity you have afforded me to share some of the things I have learned, and the facts that underpin them. Incitement: The ongoing encouragement to do more acts of terror that is rampant throughout Palestinian Arab society, starting at its politically-highest levels and extending out through the conventional media, and the social media. Enablement: Money, where it comes from, how it’s spent, and the maneuvers of those who want to conceal its role. The troublesome matter of defining terrorism, calling it by its name [see our post "18-Feb-15: Countering Vacuous Euphemisms"] and why this is so hard for important parts of Western societies to do. Practical issues that may lead to a better return on effort invested by the Congress, by the Department of Justice and by the Administration in aid of the needs of victims of overseas terror. But for the winter storm and heavy snows that paralyzed the area, this hearing would have taken place a week earlier, on Wednesday January 27, which is Holocaust Memorial Day. President Obama honored that day by takingpart in the “Righteous Among the Nations Award Ceremony” at Israel’s Washington embassy. “Tzedek, Tzedek tirdof”. The quotation is of course Biblical. But almost any Hebrew speaking child in a Jerusalem elementary school today will understand the words with no problem. Our language, along with the values it embodies, has deep roots. But even for those with no Hebrew language skills, it’s striking that one word is said twice in the three word phrase: it’s the word for “justice”, tzedek. What’s more, Hebrew uses the same word, tzedek, for both justice and righteousness. Jewish tradition, noticing the evident redundancy of that verse from Deuteronomy, extracts a simple message of timeless inspiration: When you do justice, do it in a just and righteous way. The phrase quoted by the President from Deuteronomy 16 calling on society to appoint judges who will carry out righteous judgment is followed by a simple statement of why: “…That you may live”. Justice is not meant to be only for the victims of injustice. It is for the larger society in which they and we engage and interact. Doing justice right, doing it justly, doing it with righteousness, is the way we ensure that all of us - individuals and communities - can live. Justice is not vengeance. It’s about putting things right in the name of society’s shared values and hopes. It’s a universal reality that terror victims, no matter where, go through an intensely personal , often lonely and isolating, process of dealing with the loss and pain and insult and sense of violation. They need support. Often they need advocates. To work to ensure that the rights of victims and their families are honored and respected throughout the criminal justice system. And in the Implementation Memo, issued by the Attorney General in May 2005, specific guidelines were issued that spoke of a significant commitment of resources and effort... [extracted here] These pieces collectively form the components of a valuable mission that brings tremendous credit on its authors and does substantial good. In reaching out to the OVT and in our dealings with its officers and with the DOJ at large, there is no doubt we encountered unfailing courtesy and got respectful hearings. But it has to be said that tangible results have been in short supply. We have learned far more, for instance, over the past decade about our daughter’s killers from YouTube and Twitter than from updates received from the OVT. To say it bluntly, I am sorry to report that there have been no updates. I imagine providing people like us with updates from time to time on the things being done by the DOJ and various operational agencies imposes a heavy load on the OVT. But if this is not what the OVT exists to do, then in light of what we know of its raison d’etre, what are we entitled to expect from it? Last week, in advance of coming here, I looked carefully at the Rewards for Justice website, which is listed and linked to under “Resources” on OVT’s website. I remember that in the past it had a full page devoted to my daughter’s murder but I found that that is now gone. Malki is not mentioned anywhere. While I can think of reasons why, even while being surprised about it, I was astonished to see that across the entire web site, the word Israel now appears exactly three times. (One of those is when a Palestinian Arab terrorist, born in 1936, is described as being born in “Jaffa, Israel”. 1936, of course, is a dozen years before the state of Israel was established.) Why the change? I do not know. I was puzzled by another observation: an OVT brochure (on the right) providing basic information about OVT’s work was sent to us some years ago. (I am unsure about the exact dates.) Then a fresher version came into my possession. The two look almost identical, except that the later version omits the section entitled “What are the rights of victims of overseas terrorism?”, which describes several of those rights. While the mandate of the OVT did not change in the intervening years, the message to terror victims evidently did. I can offer no explanation for this. If the explanation for the scaling-down of a focus on terror attacks in Israel is that matters of state and diplomacy trump the rights of parents of an American citizen to be kept informed, then it would help us manage our own expectations, and reduce the emotional wear-and-tear of a very challenging situation, if someone in authority would speak up and tell us that. In the particular circumstances of the terrorism that turned my family’s life upside down, we are left with a sense that things could have been managed differently and with greater and better effect. The circumstances of the massacre in the heart of Israel’s national capital on August 9, 2001 that eventually brought me here today are well enough documented that they can be summarized in just a few points [background here]. A cluster of jihadists dispatched by Hamas attacked the local branch of the Sbarro pizzeria chain on a hot Thursday afternoon during the school summer vacation. A human bomb was brought there from Ramallah by the chief planner of the operation. She had tried, and failed, to carry out another lethal explosion just days earlier inside a downtown supermarket by means of an explosive-filled beer can. This time, her bomb, prepared by an expert in such matters, was carefully concealed within a guitar case. And her target was thoughtfully selected, after several site visits she made to central Jerusalem, for the maximum number of Jewish children who could be killed in a single blow. She planted the bomb – a human bomb – and instructed him to wait until she was safely out of range and able to flee back to Ramallah. She described to a clearly delighted Arabic television interviewer in July 2012 [video] how the initial results of the explosion reached her inside an Arab taxi making its way out of Jerusalem, how the details of the steadily mounting death toll coming in over the radio filled her with joy and how the strangers traveling in the vehicle with her began smiling and cheering as the scale of the carnage became known. The death toll grew to fifteen people by that evening with tens of dozens of people injured, mostly women and children - which was always the plan. Two Americans were among the dead, one of them my Malki, the other Judith Hayman Greenbaum and the unborn first baby she was carrying. A third American woman, Joanne Finer Nachenberg, remains unconscious in a vegetative state more than 14 years later. The two-year old daughter she brought into Sbarro that day has been raised without a mother. That chief planner, the woman I have been mentioning, was 21 years old. Besides studying journalism, she had an evening job reading the news for a Palestinian Arab TV station. That day, she impassively reported the killings on camera that evening, giving no outward sign of the excitement she felt. It’s possible she was the first news presenter in history to have been the central figure in the day’s major story about which she was reading aloud the details. 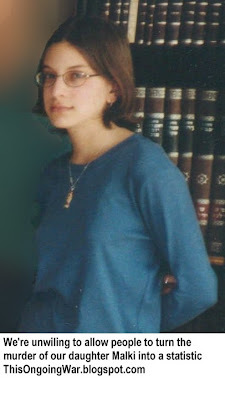 She was subsequently arrested, indicted, tried, imprisoned (for no fewer than 16 terms of life imprisonment), freed – but never pardoned - as part of a massive deal with Hamas to secure the life of an Israeli hostage, and sent back to Jordan, the land of her birth and of her parents and siblings and where she had lived almost all her life. There, after barely eight years in an Israeli prison, she has been transformed into a uniquely bizarre form of public figure – a mass murderer who regrets no aspect except that she wished the death toll were higher; whose success has made her a figure of adulation across the Middle East and beyond; who today skillfully leverages television and the social media – Twitter and Facebook, in particular – to proselytize for more killings and for greater support for those caught trying to do them. I think the public platform at her disposal and the extraordinary megaphone it gives her are literally unique in the annals of sociopathy. Nothing is more about business and less about feelings and sentiment than a legislative chamber. But the people who make laws are people, and people are the sum total of the humanity inside them. I therefore permit myself, as a witness testifying before this Committee, to describe Malki briefly. She is the reason I am here – my exuberant,ever-smiley daughter, bursting with the love of life and who is eternally going to be three months short of the sixteenth birthday we never celebrated. But since addressing the beauty of her life is hard to do on paper or briefly, I want to mention just two particular aspects of it. First, her song. In her tenth grade class at school, the girls were invited to take part in a contest. Those who could compose music, should do that. Those who could write accompanying words were advised to try. Those who could sing should sing. Malki never mentioned this competition to us, or the fact that she had embarked on composing a melody, and wrote the words, and sang it to her friends. But she didn’t complete this in time. She missed the contest deadline because when you’re fifteen, you are entitled to believe you have all the time in the world. Her devastated friends from school visited us in our home during the seven days of mourning. We learned about the song from them. It’s uplifting, optimistic, warm - exactly as Malki was. Different versions of it have been sung at concerts around the world and downloaded and streamed and shared in the years since her life’s music was stolen from us. Today, it accompanies the lives of uplifting, optimistic, warm, smiley youngsters – a wonderful heritage to share, even if hearing it remains impossibly painful for my wife and me. Then there was her cell phone. The police phoned me some weeks after the massacre that destroyed the pizzeria in the center of Jerusalem. They asked me to come downtown to collect a bag of personal effects they had identified as Malki’s. Inside, we found the mangled red phone that was always with her, and on whose screen she had been happily tapping to friends at the moment when the human bomb pressed the button on the deceptive guitar case on his back. That case, engineered by one of Hamas’ most accomplished engineers, was filled not with music but with explosives. Malki had written these words on the mouthpiece of the cell phone: Don’t speak ill of other people. That cursed guitar case, along with the human bomb who carried it, and the woman who masterminded the Sbarro massacre, are at the heart of a grotesque celebration of hateful bigotry that goes on and continues to destroy lives. It’s a process that anyone willing to look for it will see it at work daily on the streets of Jerusalem and in many other places in Israel and well beyond Israel’s borders. I will confine myself to testifying about those aspects of that young Jordanian woman’s story that are connected with justice. She confessed to the 15 Sbarro pizzeria murders at her trial including the murder of my Malki though she had no knowledge or interest in the identity of her victims once she satisfied herself that they were all Jewish. Her confession in front of the panel of three Israeli judges was proud, triumphant, accompanied by smiles. No, not the warm smiles of young women bursting to help other people and rushing to celebrate life and do good, but a different kind of smile that all of us have seen at dark moments in our lives. She has repeated her confession over and again since that time. She has done it in front of large crowds of college students, of ordinary folk, of religious functionaries and of politicians. And most of all, she has done it via the mass media, and the social media and via her weekly television program. The signs are that what she wants people to know, the people in her vast audience want to hear. Terrorism as an act of redemption and triumph. Self-destruction as a macabre celebration of life. Murder as an expression of solidarity and identification with a cause. And the urge that most of us have to be a hero in the society that raised us. If I am right, this has practical implications wherever her message reaches – and that reach certainly includes the United States. In this country, as in many other countries, her jihad-promoting weekly television program is beamed every Friday from a studio in the Hashemite Kingdom of Jordan to hundreds of thousands of households. Because the audience is Arabic-speaking, this phenomenon is largely unnoticed, slipping beneath the radar screen of mainstream observers. Nonetheless, the dissemination of the woman’s message of hateful triumph, extreme bigotry, the redemptive power of murder – all the points I mentioned a moment ago - is a reality that exacts a desperately high price in every society in which it happens. What makes this especially serious is that her platform is global even while its message remains mostly unknown to the people who – whether they know it or not – may be in her cross-hairs today or in the future. Should the OVT address any of this? Within the terms of the mandate given to it by Congress, should it be taking this challenge on board? If it did, would this contribute to preventing further deaths of American citizens at the hands of Palestinian Arab terrorists? Any rational person will ask, on hearing the trajectory of this mass-murdering woman’s life, why she ought to be helped to get her lethal brand of Islamist hatred out into the public sphere. She is obviously helped by the fact that she has been completely free and out of prison since October 2011 [Background: Shalit Deal]. But she is helped in less obvious ways as well. We ought to be asking how that help arrives and who sends it. In the world that most of us know, a felon who does some unspeakable act of violence causing the severe injury or death of a victim can expect to spend years in prison. The upside: he or she might tap into the educational opportunities that come with the sentence and emerge with a degree or other trade qualification. Some pocket money would be available, but it would mostly go on candies, personal hygiene consumables, the small expenses of living in conditions of incarceration. The downside: After serving all or most of the full sentence and/or being paroled - depending on the usual factors – the time comes to walk free. Emerging back into the real world, it’s likely to be hard to get back on a reasonable track, to re-establish connections, to find a place in society and so on. The fate of my daughter’s murderer is different. She has never had to confront social stigma or a shortage of money. She never will. I was given some calculations last week done for me by an Israeli group, Palestinian Media Watch (Palwatch.org), that has devoted years to understanding the fine details of the dangerous and disgraceful program run by the Palestinian Authority (PA) for funding its convicted terrorists and encouraging more acts of terror. On the assumption that she spent a total of 10 years one month and 4 days in Israeli prison for the fifteen acts of murder for which she was convicted and to which she confessed, the woman who masterminded the Sbarro massacre received hundreds of thousands of shekels in monthly salary, a one-time release grant and a post-prison stipend. She is not alone in this. Every single one of the several thousand Palestinian Arab murderers imprisoned in Israel as a consequence of terror receives similar fat payments, well above those available to ordinary civil servants and many professionals. At a time of huge economic uncertainty inside the Palestinian Authority and Hamas, the reliability of the cash-flow emanating from the PA’s coffers (and benefitting its own terrorists as well as those of its mortal rival Hamas) means terror is now a legitimate career option in their society. Terror pays. Plainly, terror is not going to end so long as the scheme remains viable and funded. In the most recent reporting period, that PA scheme for rewarding terror made payments of more than US $150 million. Under a certain amount of pressure from some of its donor countries (Netherlands provides a good example), and in order to safeguard continuing foreign aid funding, the PA in August 2014 engaged in what I would call a shell game trick and shut down its Ministry of Prisoners’ Affairs. The argument was that, having done this, donors could be assured that foreign aid could no longer be said to have flowed into the cash-for-terror reward scheme. I have taken a close look at the August 2014 changes because of the way they impact on killers who have affected my family’s life. What I have found leads to such obvious conclusions (namely that a fraud is being perpetrated on the donor countries, including the United States) that I am forced to the view that everyone in those countries who needs to know it’s a fraud knows it, but for political reasons chooses to pretend to believe it. To state the argument simply, there is a new Commission of Prisoners’ Affairs which makes these payments. This is not part of the PA but of the Palestine Liberation Organization (PLO). But the head of the PLO is also the head of the PA. (His name is Mahmoud Abbas, and his day job is president of Palestine.) The head of the Commission is a man called Qaraqe who, by no coincidence, was also the head of the PA ministry that shut down a day before the new commission started. The web address of the new commission is identical to the web address of the now-shuttered ministry. The money which the PLO spends on its prisoner payments scheme is exactly the same as the sum spent by the closed-down ministry. There are more details but to recount them here would be to take seriously the assertion that something changed. This vexed issue of foreign taxpayers delivering up unspeakably large amounts of money to politicians prepared to lie right into the faces of the donors is a key factor in the enduring nature of terrorist savagery, Palestinian Arab-style. The US provides a substantial part of the money that makes this possible. Whether or not the president of the PA, Mahmoud Abbas, is good for peace or bad for peace is probably seen by most as a political question calling for political judgement. But public statements by the head of state of the Palestinian Authority urging greater recognition of the alleged heroism of Palestinian Arabs who engage in terror against Israelis do not call for political judgement. No matter what his views, or ours, of a one-state solution versus a two-state solution, or an immediate end to occupation as a precondition to peace negotiations, it means something very concrete when he appears in public holding aloft the hands of convicted terrorist prisoners and declares them to be “political prisoners”, “freedom fighters” and his nation’s heroes. 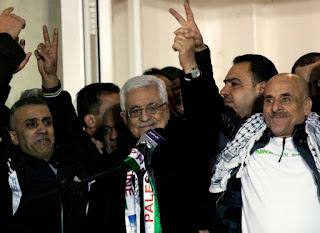 Even if Mr Abbas had ever publicly condemned a specific Palestinian Arab for engaging in a terrorist act, we would still think that the preponderance of his messages encouraging such acts amounts to clear encouragement of terror from his people’s most influential single voice. But we have checked carefully, and we believe he has never once issued such a condemnation. Moreover, while she was still in an Israeli prison cell serving her sixteen life terms (prior to being released in 2011), Mr Abbas awarded the murderer of our daughter the Palestinian Authority's highest medal, the Al Quds Mark of Honor. Why has so little been done? I have already mentioned here that the criticism we feel is not directed at the people of the DOJ with whom we have had dealings. My wife and I have been treated by them respectfully and courteously. Everything we have seen tells us the DOJ people are committed to doing their jobs professionally and have sought to do so. Why has so little of a practical nature come from those interactions? We do not know. We do not know what efforts have been made by them. To the extent those efforts are being, or were, undertaken within the confines of the legal system, we know that confidentiality can play a major role. But since justice is the heart of our concerns, and years have gone by without update or result, it has to be said that justice has not been achieved here. At the same time, it should also be acknowledged that the responsibility of the US government is to administer justice for its citizens, including for my murdered daughter Malki and for her family. If some larger truth lies behind the lack of momentum, that truth ought to be disclosed. If diplomatic considerations override the law enforcement imperatives, we wish that were made known too. If foreign governments are thwarting US government efforts to enforce its laws, that too should be known. Washington is not just about laws and values. It’s about politics – both domestic and global. If for instance this great nation’s relations with the Hashemite Kingdom of Jordan and the Palestinian Authority take precedence over the pursuit of justice and the protection of innocent civilians and their lives, then as painful, as distasteful, as that would be, it’s the kind of thing that societies do. We don't know that that is what has happened. We don’t say it has, even if others say it is perfectly obvious to them that it has. But if – and I am just speculating – the inaction were the deliberate outcome of political thinking, then we could call it a terrible mistake, we could try to persuade the appropriate decision makers to see it differently, we could appeal to public sentiment that might agree with us. And we could hope for a new and different strategy. But we do not know. Our efforts to help ourselves and to be helped by others whose role is to help, have been unhelpful. It hurts, saddens and enrages me that the OVT, which was once created by a law named after my 13 year old son who was beaten to death by terrorists--is not being used to help families such as ours. Koby Mandell's name was expunged from the OVT website with no sign that it was ever there. I did get a phone call telling me that the US government was closing the case--even though the killers were never found. They closed the case, burying Koby again. Causing us another round of pain. The office that was created in my son's name to protect us, instead damages us. There has been no communication since. No sign that the OVT could care less about an innocent 13 year old American boy named Koby--or others like him. You don't have to post this, Mr. Roth; I just wanted to let you know that your link to [Transcript of Pres Obama’s January 27, 2016 speech] appears to lead to your hard drive. The link does not attempt to open at all, a good thing for you. I think you know what to do. May justice come for you and your family, and for Jews everywhere; may we all greet Mashiach together. Halevay all our challenges had such straightforward solutions.